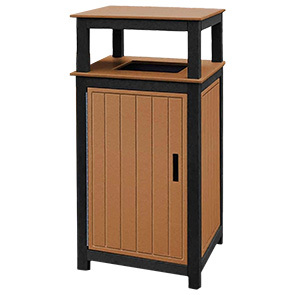 Crafted with 100% recycled plastic lumber, this 32 gallon receptacle requires nearly no maintenance. It will not chip or rust, and can be cleaned with a simple degreaser. The sturdy bin has a large waste capacity and feature a hinged side door providing easy access to change backs. The hinges of the door are made with stainless steel that won't corrode from the effects of weather conditions. Popular color options are available to enhance the atmosphere. This receptacle is a great choice for both indoor and outdoor locations.